Direct charge hit now does 50 damage + 10 per head (up to 5 heads). Removed restriction that arrows need to be aimed before they can be lit by a Pyro. Changed bow so you can start charging it while you're jumping, but you can't fire until you're on the ground. Fixed bug where flame effect would get stuck on if you change weapons with a lit arrow. Moved Crafting button out to the root class/backpack selection panel. Dragging and dropping items in your backpack now makes appropriate sounds. Bots don't retreat to gather health as readily if they are in combat. Bots no longer retreat when moving to block a point capture. Bots should now equip an appropriate combat weapon and fight while moving to collect health. Bots who are roaming the map and hunting now chase down their victims, following them around corners. Bots That fire projectiles (ie: rockets/grenades/etc) don't hold down their fire button for a minimum time. This was causing Soldier bots to fire rockets into nearby walls as they strafed, killing themselves. Soldiers bots now switch to their shotgun after firing all four rockets when engaging an enemy. Added a few more bot names from community suggestions. Fixed a behavior loop with Engineer metal gathering. Added a slight speed reduction to stunned players. "Last-weapon" initialization on respawn now sets itself to be the melee weapon if you donâ€ t have a selectable secondary weapon (like The Razorback). Fixed an case where The Gunboats didnâ€ t apply their damage reduction properly. The amount count in the HUD now flashes red when youâ€ re low on ammo. Extinguishing a burning teammate now earns a full bonus point (was half a point). Fixed a permanent overheal exploit involving dispensers. Fixed a bug in spectator mode where the user aborted out of freezecam, setup a spec mode (like IN_EYE), and would then have the setting stomped after the freezecam timer expired. Fixed bug with disguised spy sometimes seeing his own name in the disguise status HUD. Fixed a client crash that could result from players with arrows embedded in them. Fixed items that can be worn by any class having the wrong model when worn by a disguised Spy. Added missing map prefixes to server browser game types. 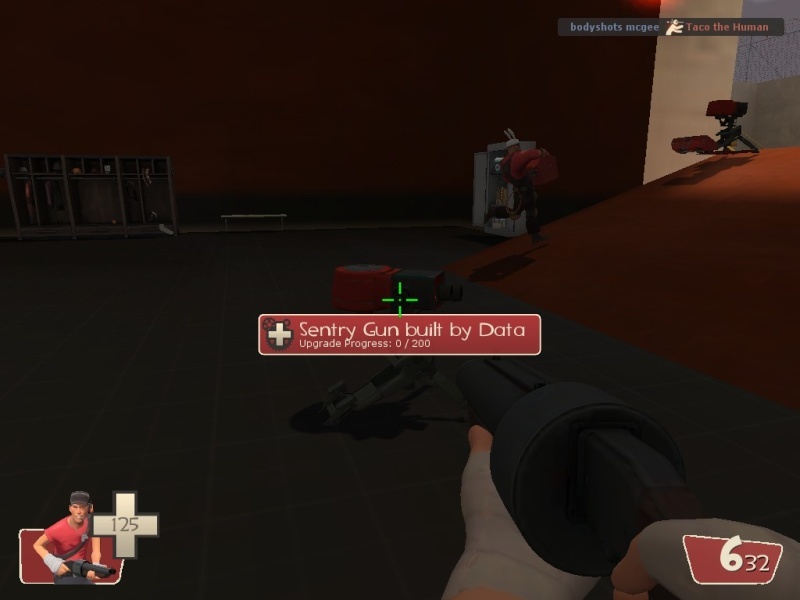 Killing yourself with your own sentry no longer increments the sentry's kill counter. Fixed dropped hats sometimes having the wrong team color. Fixed crit-boosted players not getting critical hits if their weapon has custom no-crit behavior. Fixed the achievement dialog taking a long time to pop up, and completed achievements now sort to the bottom of the list. Fixed Spies disguised as Medics hearing the autocaller sound. you guys know me, you guys know how much i love the airblast. you guys know how much i am loving this update. They fixed the Pyro and the Heavy! but... THEY BUFFED THE PYRO!!! LOOK IT'S ADAM!!! wrote: but... THEY BUFFED THE PYRO!!! yea i while reading i was thinking about you adam, these are really fair changes. When is this update coming out? I haven't received a HLDS announcement. I never knew there was an overheal exploit, how does it work? If you touch a dispenser while a medic is healing you, the overheal sticks. That means that the medic can leave and whatever overheal you had (whether it be the full 150% or just 125% or whatever) stays with you and is just like extra health. It can't be restored with medpacks or respawn though. Very useful indeed. damn if only i have known this sooner. anyway i updated both our servers. I did see a message in the alliedmods forum that someone reported the rankings plugin isn't working anymore so i will test this asap. http://tf2wiki.net/wiki/Crit-a-Cola this sounds like more fun then bonk. Anyway, after doing the server updates and rebooting the servers they would not come back up again!!! Researching this it turns out that Valve has changes some of the linux files (our servers are linux) which causes sourcemod and metamod to stop functioning! So we have a really clean server untill the sourcemod developers bring out an update (i'm sure this will be done fast since a lot of TF2 servers use sourcemod). Because of the update Sourcemod is broken, therefo rmy adminpanel doesn't work alogn with a lot of other things. 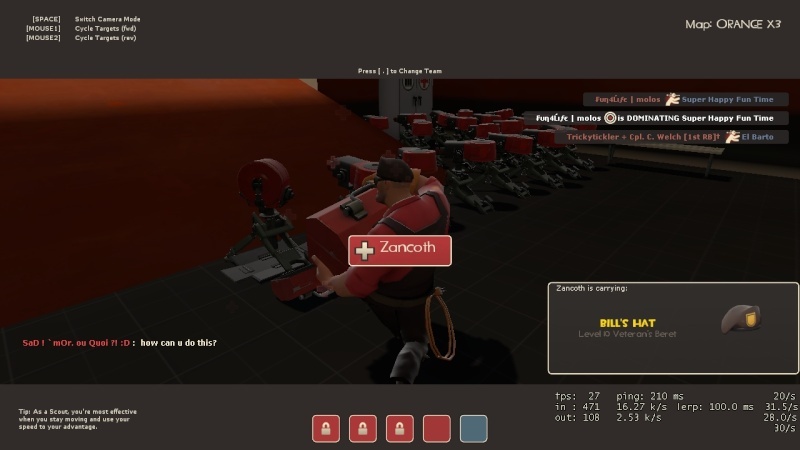 Anyway, there is this guy called Zancoth who is cheating/exploiting making him able to build unlimited sentries. Atra Rosa is making a demo for us, she'll be posting it later in this thread (I hope). ill miss the contact damage but i LOVE THE AIRBLAST! !!!!!!YAY! There were two other exploiter on the servers. Here they are. His name was data. As you can also see in the pic. Then the second one was in blue spawn. I also got a demo thanks to Adam. Who helped me create a demo before. Now could someone tell me how to put the demos here? OMFG PULP IS BEING INVADED!!!!! ERASER WE NEEDZ THE ADMINZ NOWZ! btw Adam what did you do with you Demo thread. Upload your demo to a filesharing site like MediaFire (fast unlimited downloads even for non-members) then put the sharing url here. Anyway, they know that what they do shouldn't be possible thus wrong. Yet they choose to do it making them nothing but exploiters which in my book is the same as a cheater, especially since they know it is wrong. Banning them is only the right thing to do. I see what your saying. I agree with you a little bit, but a new update makes people act like idiots, even if their not. Just saying to take that into account when thinking about banning. YES it would be nice if everyone played by the rules. BUT this game is full of assholes, left right and center. They could have personality disorders act like jerks and still not get banned. If people can act like boneheads while we're at full strength, why get angry at people who do somthing that WILL be fixed. As i've said... No one is going to play for real until they fix it all. So this is the file sharing url. Now what do I do?